One of the things we love most about New York’s historic neighborhoods is that they each have their own distinct architectural style. 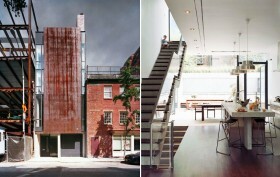 So we were a little discombobulated (in a good way) when we saw Matthew Baird Architects‘s Greenwich Street Townhouse, which has infused the industrial, rough-edged style of the Meatpacking District into a traditional West Village-rowhouse streetscape. When they embarked on the project, both the architect and the client sought a contemporary, reductive exterior design to contrast with the warm ambiance and simple materials of the 5,000-square-foot interior. Baird’s interest in prefabrication inspired the construction of the façade from a single piece of raw steel, which was lifted from a truck and bolted into place. When the 40′ x 14′ slab was transported, the inbound lanes on one level of the George Washington Bridge had to be closed!